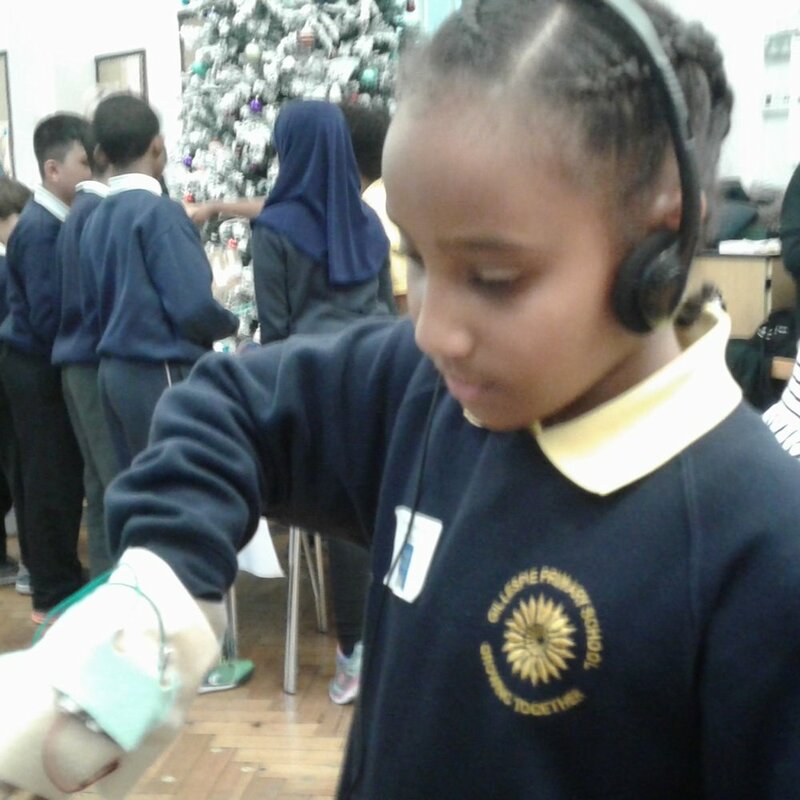 It was a cold and gloomy winter’s afternoon, but Canonbury Primary School was full of joy, excitement and light as children from eight Islington schools set up their stalls for the Winter Physics Fair. Each team of children brought with them a different interactive physics-related workshop, which they had been working on at school, and which they couldn’t wait to share with each other. 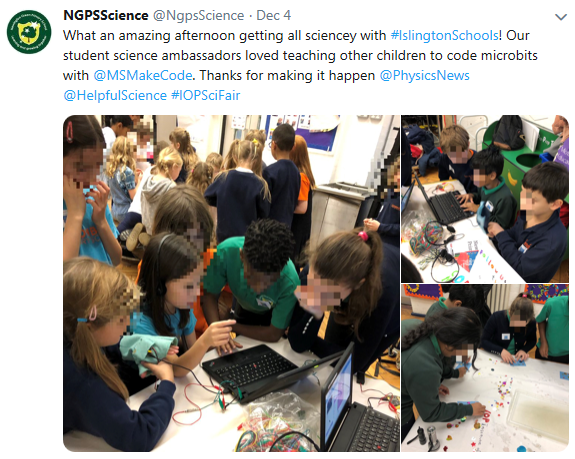 Newington Green, whose Science Lead Chloe tweeted about the event (see photos above), used their new SfL-funded MicroBit kits to create and code gesture-controlled musical gloves, which they learnt how to do at our SfL workshop with inventor Helen Leigh earlier this term. Hanover used their new MicroBits to code a remote controlled robot, which was able to draw by itself! 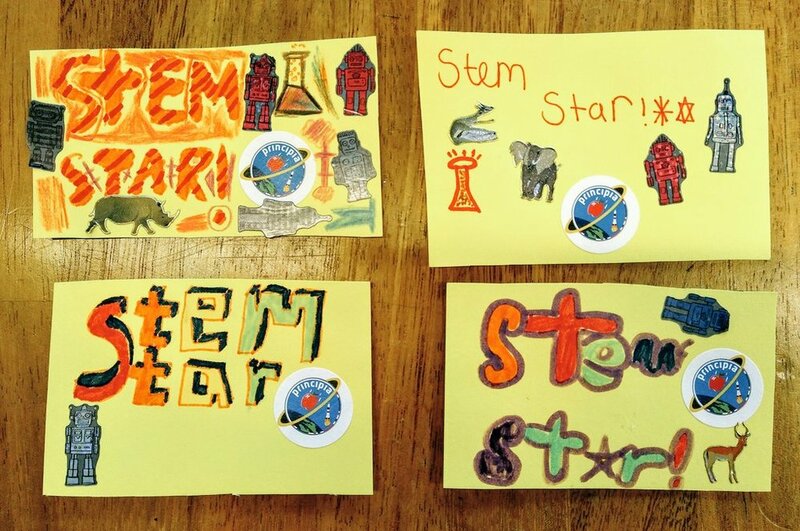 Many schools were inspired by the topic of electricity: Canonbury showed everyone how to make mini brushbots that busily buzzed around, Montem built interactive quizzes using circuits, Thornhill created squishy playdough circuits (including Rudolf the reindeer, whose nose really did light up!) and Pakeman brought an energy stick for a hands-on investigation of conductors and insulators. Pakeman also brought balloon cars, and Gillespie built a space station for their dolls as well as a couple of zoetropes, having been fascinated by them at the Equal Play Symposium at City Hall. A team of KS3 pupils from St Mary Magdalene Academy brought with them Lego robots that they had programmed. The fair was supported by Emma Watson and her colleagues from the public engagement team at the Institute of Physics - they helped with resources and even ran two fantastic workshops themselves, where children could try their hand at UV photography and making bracelets with UV beads. Mark from the Institute of Physics showing off his UV art Christmas card! Photo taken by Emma Watson. After an initial hour during which children visited each others’ stalls, family members arrived to try out all the activities. We were also delighted that three ‘STEM Stars’ were able to join us - scientists who we had invited to visit the fair, give the children feedback on their stalls, and speak with them about their jobs. The children had made them special badges so they could easily be recognised as they visited the stalls. It was standing room only for Alom Shaha’s Family Science Show! Alom demonstrated a whole range of surprising and exciting scientific phenomena, using equipment and materials commonly found at home. He emphasised that his demos were only a first step - and encouraged family members to try them at home with their children, and to try to work out scientific explanations for what was going on. Alom pointed out that science begins with questions, then needs to be followed up with research and investigations. And that a lot of science can be done at home! “Thank you for inviting me to take part in the science fair and show at Canonbury School yesterday. I’ve taken part in far more famous science festivals but can honestly say that I have not attended one that felt as special. It was wonderful to see so many children and parents from such diverse backgrounds and to see science being made a part of the school’s cultural provision to the community - something that I have long wanted to see spread to other schools. 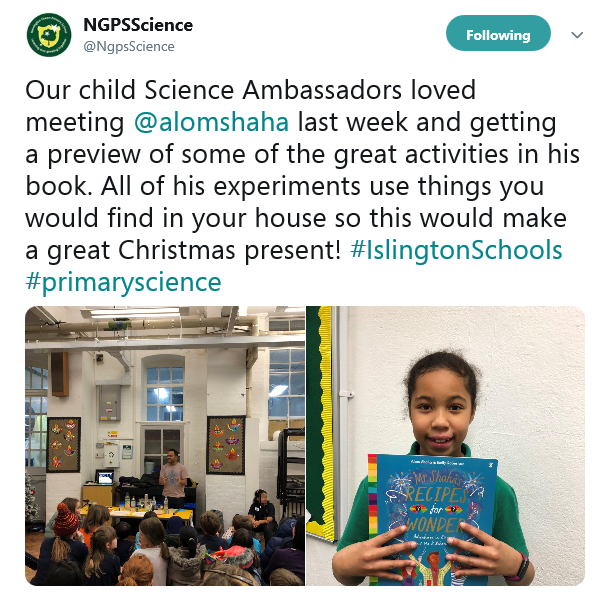 Every child who participated in the Winter Physics Fair was given a goody bag to take home - full of physics activities to do at home courtesy of the Institute of Physics, as well as a copy of Alom Shaha’s book, Mr Shaha’s Recipes for Wonder, funded by SfL. This book is packed with ideas and guidance for exploring science at home. We will be following up later in the year to find out which of the activities children tried out with their families. Around this time last year we put on our first collaborative Family Learning Night, led by children from Pakeman and Gillespie schools, and attended by children from Thornhill. That was a stepping stone that led to us putting on our Winter Physics Fair and Family Science Show - look out for more collaborative science projects and events over the course of this year and next!